Born in Liverpool in 1969, Simon studied with John Harle at the Guildhall School of Music & Drama, graduating with Distinction in 1992. During his studies Simon won a succession of awards, scholarships and competitions including the Principal’s Prize and was the first wind player to be accepted for the prestigious YCAT award. He was Professor of Saxophone at the Guildhall for over 10 years, is currently Visiting Professor of Saxophone at the Royal Scottish Academy of Music and has given masterclasses at the Royal College of Music, Royal Northern College of Music and the Birmingham Conservatoire of Music. Simon is much sought after as a recitalist and ensemble player, appearing with the Graham Fitkin Group, Michael Nyman Band, Nash Ensemble, Composers’ Ensemble and all the London Orchestras. 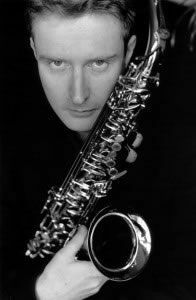 He was appointed Principal Saxophone of the London Sinfonietta in 1997. He recently joined Will Gregory’s Synth Orchestra as EWI and keyboard player. As a soloist, Simon has appeared with the London Sinfonietta, Philharmonia Orchestra, London Philharmonic Orchestra, English Chamber Orchestra, London Chamber Orchestra, BBC Concert Orchestra, BBC Scottish Symphony Orchestra, Royal Liverpool Philharmonic Orchestra, Orchestra Of St John’s, Soloists of the Royal Opera House, East Of England Orchestra, Johannesburg Symphony Orchestra and Malaysian Philharmonic Orchestra. Simon has given several world premieres: Andrew Poppy‘s double concerto Horn, Horn, commissioned by the Royal Liverpool Philharmonic Orchestra for Simon & John Harle, Dave Heath’s Moroccan Fantasy commissioned for Simon by the East of England Orchestra and Tan Dun’s Orchestral Theatre III: Red Forecast with the BBC Scottish Symphony Orchestra at the 1996 Huddersfield Contemporary Music Festival. Another work, Dave Heath’s Dawn of a New Age was commissioned by the King’s Lynn Festival for Simon & Evelyn Glennie and was first performed in July 1999. Waleed Howrani’s Concerto for Alto Saxophone was also given it’s world premiere by Simon with the English Chamber Orchestra in 2007. The London Sinfonietta have commissioned two solo works for Simon. The Colour of Scars, a new concerto by Fraser Trainer, which was given its world premiere at the Queen Elizabeth Hall in May 2001 and iris, by Tansy Davis, which was premiered at the Cheltenham Festival in 2004. In 2008 Simon was invited by Sir Harrison Birtwistle to perform in the world premier of his new opera “The Minotaur” at the Royal Opera House, Covent Garden, and was subsequently invited back by music director Tony Pappano to perform in the 2009 production of Berg’s “Lulu”. As a chamber musician Simon has formed several successful duos and ensembles, notably with pianist Scott Mitchell, percussionist Daniella Ganeva and also the Duke Quartet. He presented an evening of minimalist works at the Barbican Hall for the BBC John Adams festival in 2002 with one such ensemble. Simon has been recording primarily for the Black Box Music label in recent years, and his first solo CD for them, entitled On Fire, was released in 1998 and features six world premiere recordings of British saxophone music with piano and electronics. Subsequently, Alone… (1999) featuring minimalist songs and themes and Frame(2001) including the world premiere recording of Michael Nyman’s The Piano Sings, have been released to critical acclaim. A recording of Michael Nyman’s concerto, Where the Bee Dances with the Ulster Orchestra was released on the Naxos label and Simon has also made CD’s with Virgin Classics and Cala Records. His interest in technology has led Simon into the worlds of recording and producing, working on album projects for a diverse range of artists and record labels, from Richard Rodney Bennett to the Nash Ensemble. Simon has worked at the Royal National Theatre on productions of The Resistible Rise of Arturo Ui, Pygmalion, All My Sons, Power, Mother Claps Molly House, Mourning Becomes Electra, Present Laughter, Major Barbara, The White Guard and London Road. He is also involved with the education departments of the London Sinfonietta, Britten Sinfonia and East of England Orchestra, working with children and adults both around Britain and Europe in composition, improvisation and music theatre workshops.